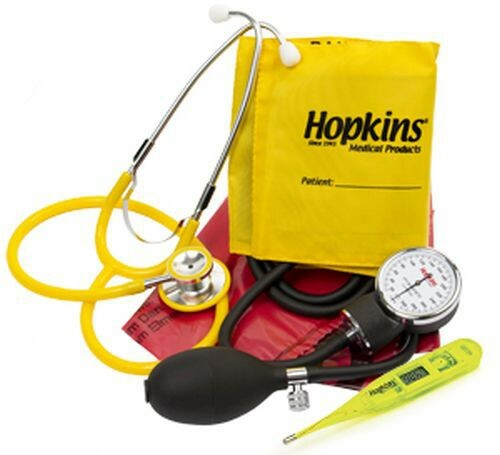 Isolation Vital Signs Kit, manufactured by Hopkins Medical Products, is a single-patient use kit to assist with diagnostics. 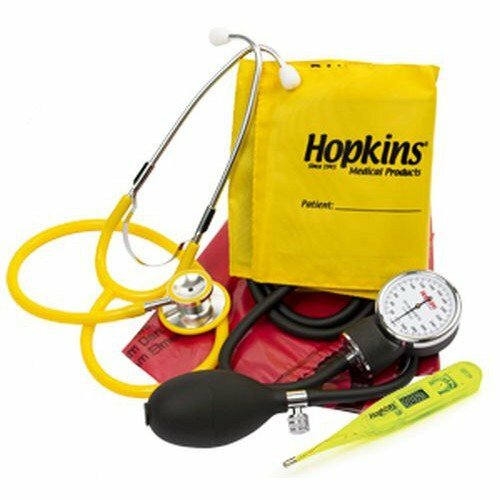 Including a disposable aneroid gauge sphygmomanometer, digital thermometer, and dual head stethoscope; this kit is perfect for obtaining vital signs in a hospital isolation environment. Each item in the kit is brightly colored so a medical professional can easily and quickly identify the components. In addition to easy identification, there is even a location on the blood pressure cuff to write down a patient's name to prevent cross-contamination. Available in several different sizes, including child, adult and large adult. Brightly colored diagnostic products for easy identification. Perfect for use in hospitals, healthcare facilities, and home care settings. Single-patient use to prevent cross-contamination. Product Number: 694863, 694865, 694862, 694863CA, 694865CA, and 694862CA. Color: Bright and easily recognizable colors. Application: To prevent hospital infections and cross-contamination during the collection of vital signs.